The Home Affairs Select Committee has been holding an inquiry into Police and Crime Commissioners. As far as I can see they’ve never published a specific call for contributions from the public, but the committee’s home page links to guidance for those submitting written evidence. While the investigation’s webpage states: “Inquiry status: oral evidence concluded” the report hasn’t been published yet so a submission might still be timely. The evidence sessions held to-date have considered the operation of both Police and Crime Panels and Police and Crime Commissioners. Written evidence submitted by Richard Taylor in a personal capacity in relation to the committee’s inquiry on Police and Crime Commissioners. I am someone who has taken an interest in the way my local police force has been overseen and how its strategic policies have been set; first under Cambridgeshire Police Authority and latterly under our Police and Crime Commissioner. I have also been following the work of our Police and Crime Panel. I would like to share some of my observations and experiences with the committee. Cambridgeshire’s Police and Crime Panel has only been considering those decisions by the Police and Crime Commissioner which the commissioner has volunteered to report to them. Cambridgeshire’s Police and Crime Panel appear to have taken the approach, to-date, that they will only do the minimum they are statutorily required to do. It is clear from media coverage and material published on the commissioner’s website that Cambridgeshire’s Police and Crime Commissioner has taken decisions which he has not reported to the panel for scrutiny, and which the panel have not proactively sought out to consider. Decisions relating to the police’s performance answering calls to their non-emergency phone number are one example of decisions referred to by the commissioner in the media and at public meetings but which have not appeared in the decision log on the commissioner’s website, or been reported to the Police and Crime Panel. Under Cambridgeshire Police Authority proposed changes to police policies were published in advance of meetings, it was possible to lobby decision makers prior to the decisions being made, and the decisions were taken at public meetings. Cambridgeshire’s Police and Crime Commissioner’s key decision making body, his Business Co-ordination Board, is held in private, and without agendas and papers being published in advance. While the Chief Constable and other senior officers regularly appeared in public at Police Authority meetings to defend, explain and take questions on their policy proposals and on the force’s performance, since the transition to the Police and Crime Commissioner this has not happened. I think locally there has been a significant reduction in the transparency of both police policy making and the monitoring of police performance. I don’t think a reduction in transparency was an inevitable consequence of the transition to Police and Crime Commissioners but it has been what I’ve experienced in Cambridgeshire. I am aware that the Commissioner and the Panel are both locally accountable and I have made representations directly to the Police and Crime Panel. ( eg. rtaylor.co.uk/6625 ) While the panel’s response to my suggestions was initially hostile, it does appear they are now acting on some of them. One of Cambridgeshire Police and Crime Panel’s members, an independent member, has been absent without explanation for a whole year. I would like to see the committee encourage Police and Crime Panels to be proactive in their roles, for example monitoring the Police and Crime Commissioner’s activity via all routes available to them including by monitoring commissioners’ websites and public statements in the media and at public events. I would also like to see the committee recommend panels and commissioners actively look at what is being done elsewhere in the country and consider adopting ideas they find elsewhere. I have ignored this in the interests of transparency, however at the risk that it may cause my submission to be rejected. Even if the submission is rejected on the grounds I have published it I feel I’ve done what I can to draw the committee’s attention to some aspects of what’s happening in Cambridgeshire. 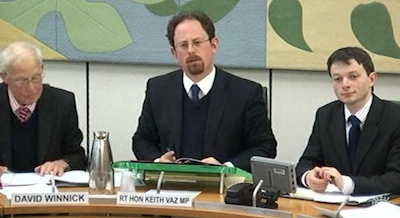 I hope publishing a submission to a committee is not considered actionable contempt of Parliament; if it is I’ve unwittingly done it before and no-one complained, though I see I have in the past followed a request not to publish a submission, at least until after publication of a report. Having to consider if you’re committing an offence by writing about a submission to a parliamentary committee doesn’t help make the process accessible. I would consider it morally wrong to make a submission to the committee and not make it public. In the House of Commons contempts are referred to the Committee on Standards and Privileges but any decision must be agreed by the House. If true that appears to make action against my publication of this blog post implausible and there doesn’t appear to be a realistic risk of me losing either my freedom or my house as a consequence of publishing this article. My submission is not included. Presumably it’s not been accepted for some reason. In Cambridgeshire, the PCC launched a system to enable Neighbourhood Watch to become even more active in making communities safer. Neighbourhood Alert is a live system that allows messages to be targeted at street level to email subscribers. Neighbourhood Alert allows Neighbourhood Watch and the police to talk directly to the people they need to, when they need to. At Cambridge’s East Area Committee in April 2014 there were concerns raised that the “Neighbourhood Alert” system, far from giving street level targeting, was in practice not as geographically tailored as the previous E-Cops system. The meeting also heard from the area’s only active Neighbourhood Watch co-ordinator who reported he wasn’t on the new “Alert” system. See: My video of the policing section at the meeting and my article on what Police and Crime Commissioner calls his “ALERT” system. The role of PCCs in holding chief constables to account is characterized by transparency and rigour. A good example is Cambridgeshire which holds a Business Co-ordination Board (BCB), a monthly meeting between the Commissioner, Deputy Commissioner, ACPO rank officers and senior officers of the OPCC. This is a forum in which current and future business is discussed between the senior leaders of the two bodies, focussing on issues relating to strategy, governance, business and holding the Chief Constable to account. It is one forum in which decisions can be made by the Commissioner, informed by the decision making policy. Minutes of the meeting and key papers are published on the Commissioner’s website. The board’s agenda and papers are not made public in advance, and the meetings themselves are held behind closed doors. I’ve been urging our Police and Crime Panel to look into the arrangements for the board, as one of the decisions the commissioner has made, but not reported to the panel for scrutiny. I think it ought be made available to all at the same time; so there can be properly informed debate and discussion. It suggests that commissioners should be made to publish upcoming key decisions in advance; I think this is an excellent idea which would result in commissioners operating more openly and transparently and ensure that those with an interest in a decision can make representations in relation to it. Linked to the suggestion of publishing upcoming decisions there is a proposal the Home Office should publish guidance for commissioners on what constitutes a decision. Together these recommendations address some of the major points I made in my submission. They address the major thing I said I’d lost in the transfer to Police and Crime Commissioners – the ability to find out about proposed changes to police policy and strategy in advance, and to comment on them. Making clear what counts as a decision will help the Police and Crime Panel use their powers to scrutinise the Police and Crime Commissioner’s decisions. I hope the committee’s recommendation for a “transition period” for newly elected Police and Crime Commissioners doesn’t mean the old ones are going to stick around for a few weeks after the public have booted them out at the ballot box. The recommendation is unclear.